Jay Mauchley, Professor Emeritus at the University of Idaho, has played hundreds of concerts throughout the United States as a soloist and chamber musician, including numerous duo-piano recitals and concerto appearances with his wife, Sandy. Among their achievements, Jay and Sandy, the Mauchley-Duo, have appeared on National Public Radio’s “Performance Today,” and have been presenters and featured as guest artists on national, district, and state MTNA conventions, the American Liszt Society Festivals, at the Smithsonian in Washington D.C. and major cities throughout the country. In constant demand as a clinician, adjudicator and master teacher, Dr. Mauchley was awarded the Master Teacher Certificate by Music Teachers’ National Association and received the Alumni Award for Faculty Excellence at the University of Idaho. In addition to the Red Lodge Festival, Jay also coaches and performs at the Interlochen Center for the Arts in Michigan. 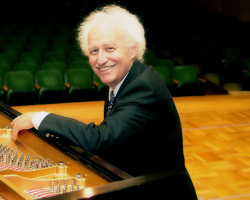 Dr. Mauchley earned the Doctor of Music degree in piano performance with “High Distinction” from Indiana University, where he studied with Professors Dr. Karen Shaw and Menahem Pressler. His students have won several piano competitions, and many have gone on to receive advanced degrees and to become successful piano teachers and performers. Jay is on the international roster of Steinway Artists.